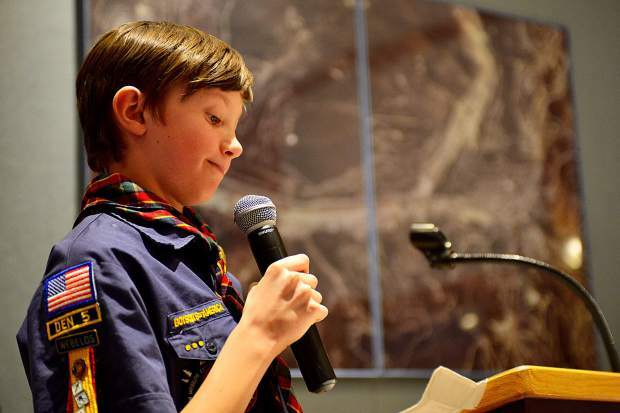 Boy Scout Eli Larson asks Breckenridge Town Council to support a town-wide, clean-energy resolution Tuesday night that affirms the town’s commitment to having all its buildings, public and private, entirely powered by renewable electricity by 2035. Proponents of two clean-energy goals in Breckenridge can declare victory after town council unanimously backed their second resolution Tuesday night, affirming the town’s commitment to having all town buildings — public and private — completely powered by renewable resources by 2035. As a group of concerned citizens supporting the resolution settled in for their final push after months of work, about a half-dozen people spoke out in support of the townwide, clean-energy resolution that’s been a long time coming. The speakers included regular campaign supporters, who’ve made their presence known at council meetings since first pitching the two resolutions in June, along with a couple of new allies, including professional athletes with the Protect Our Winters Riders Alliance and one local Boy Scout, Eli Larson, who came in his uniform. The effort to secure passage of the nonbinding resolution began this summer, and even though Tuesday’s vote was unanimous, it didn’t come without some discontent. “This has been a real struggle for me,” Councilwoman Wendy Wolfe said, explaining her reservations before casting a vote in favor of the resolution, the second clean-energy commitment council has adopted in the last three months. 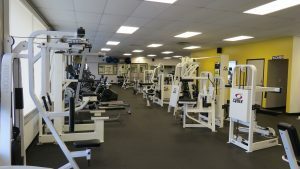 In August, council passed a similar resolution stating the town’s commitment to having all town facilities powered by renewable resources by 2025, but extending that commitment townwide was a bridge too far at the time, with individual council members expressing fears the broader measure could drive up electricity costs and bind the hands of future councils. Much of that opposition had been quelled by the last council meeting in October, however, when Wolfe remained the lone holdout and the other five council members and mayor all voiced their support for the townwide resolution for 2035. For Wolfe, it had as much to do with economic sustainability as it did the environment, and reading a story published Aug. 13 in the Denver Post, she noted that the town of Nederland recently passed a similar resolution with a 2030 target, but will likely have to “bridge a gap” to reach that goal. At that, Wolfe cast her vote, the resolution passed and the packed gallery erupted in a boisterous round of applause. While the town facilities on renewable electricity will require investments in infrastructure, some of which have been included in the town’s 2018 budget, it’s widely agreed that Breckenridge can’t meet the townwide goal without renegotiating its agreement with power provider Xcel Energy. In turn, the resolution is meant to be a statement to Xcel more than anything, putting the town’s power provider on notice that, of all the power Xcel sells in Colorado, Breckenridge wants its small share to come from renewable resources. 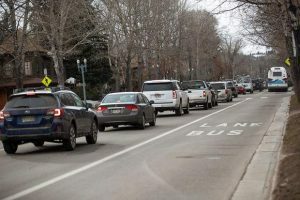 In passing the townwide commitment, Breckenridge joins a growing list of mountain communities, including Aspen, Avon and Nederland, along with bigger cities like Boulder, Pueblo and even Salt Lake City, Utah, in affirming their commitments to clean-energy goals.